As Minneapolis pushes to reduce greenhouse gas emissions by nearly a third by 2025, city leaders are debating what role their franchise agreements with utility companies should play. 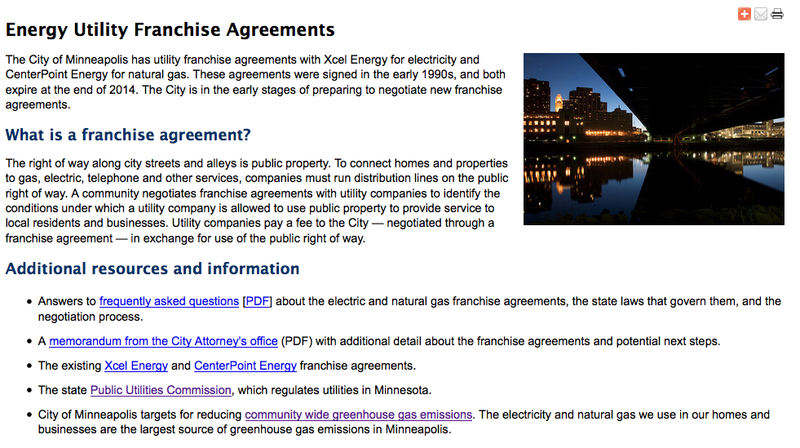 The agreements, signed in the early 1990s, give Xcel Energy and CenterPoint Energy space below or along streets, alleys and other public rights of way in exchange for millions of dollars in franchise fees. But the city imposes no renewable energy requirements in the contracts. Minnesota law doesn’t allow municipalities to make those conditions in franchise agreements. City Council members last week voted to create a work group to help determine the city’s future with Xcel and CenterPoint, whose agreements expire at the end of 2014. Officials expect to examine a range of possibilities, including pressing the state to give cities more authority in their utility agreements, reducing the span of agreements to just a couple of years rather than decades and having the city take over providing utilities. Examining franchise contracts is only one way to meet emissions targets, said Council Member Elizabeth Glidden, who chairs the regulatory committee. “But it’s a big agreement, and it is directly with utility companies, and so, obviously, thinking about those goals, and is there a way to impact them, is going to be on our minds,” she said. Our campaign is generating a lot of public interest in the city’s expiring contracts with Xcel and CenterPoint Energy, so much so that the city’s communications department just launched a new website to explain the process! 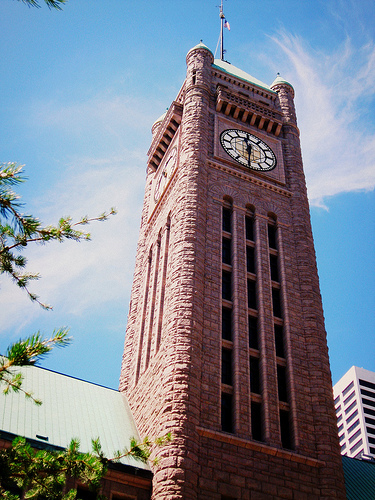 Check out the city of Minneapolis energy franchise home! On Tuesday morning, former Boulder mayor Susan Osborne shared the story of her city’s pursuit of clean, local, affordable energy. It starts years ago with consideration of forming a municipal utility, but it wasn’t brought to a head until Xcel Energy built a failed smart grid “beta” and reneged on an offer to build a nearby wind farm for Boulder’s use. In 2011, the voters of Boulder gave the city approval to pursue municipalization, a multi-year process. Click to listen to Susan’s presentation. Watch the video, too! A pair of expiring land-use agreements between Minneapolis and the state’s largest utilities has opened up a debate over the city’s role in pushing for greater investments in renewable energy and energy efficiency. The debate centers on a pair of 20-year-old franchise agreements that the city has with Xcel Energy and CenterPoint Energy and are expiring at the end of 2014. The agreements focus on the fees a utility pays to use public rights-of-way, but advocates say they could also be used as a tool to get utilities to invest in city priorities. “This is the city’s opportunity to see what they can do, and they should push as hard as they can to get as much as they can,” said Ken Bradley, a program director withEnvironment Minnesota. Environment Minnesota is among the organizations participating in a recently formed group, Minneapolis Energy Options, which is pushing city leaders to seek investments in energy efficiency and renewable power as they work on fresh franchise agreements. Boulder Energy Future Motion Graphic from robb shurr on Vimeo.